1. “Act” confident. You don’t have to “be” confident, but you do have to “act” confident. This will make the ladies take you seriously. Ladies think confidence is very attractive. Why would she want to like you if you don’t like yourself? 2. As a geek, you may be tempted to strut your intellectual prowess by lording it over the lady you’re flirting with. Don’t do it! This is an irritating strategy that will backfire. 3. At parties, don't be everywhere your lady is, and don't track her movements. Move around and mingle with some of the other people there. 4. Be a dude who is fun to be around, knows things, and makes the world and the people around him better. You don’t have to be the smartest man on the planet, but be knowledgeable about the world around you. 5. Build your self-esteem if you really want to be less shy. With good self-esteem, you will feel like you are a wonderful person who can have all of the awesome things you deserve. There are lots of ways to do this (e.g., learning a new skill, volunteering for a good cause, etc.). 6. Do NOT stalk your lady’s house, her Facebook page, or any other “personal” space. That is not cool. It will totally freak her out and kill your chances with her. 7. Don’t ask a lady to go out with you if you have nothing to suggest. That’s poor planning and will make you look a bit nerdy. You don’t need some brilliant plan for a first date, just something simple (e.g., go to a movie). 8. Don’t be that man that thinks he can do no wrong and that every word out of his mouth is a revelation. 9. Don’t compare yourself to others. You are unique and cool – and only you can offer the world the amazing things you have to offer. 10. Don’t forget to find enjoyment in the things that your lady likes, not just show her all the things that you enjoy. If she’s a lady worth dating, she’ll have good taste. Just trust her and let her be your guide on the road to new and fun activities. 11. Don’t worry about getting rejected. Everyone gets rejected. If someone rejects you, don’t take it personally. It just means that she’s not the right lady for you. 12. Don't present yourself as Mr. Genius. You probably are very intelligent, and you probably are more knowledgeable than most people about your “special interest.” But, she's probably just as smart - if not smarter - than you in a few areas. If she was really so stupid, you wouldn't want to be with her. Appreciate the things that she knows about, and give her the opportunity to show you those things. 13. Don't use “pick-up lines.” Just be honest with your lady and say what you're really feeling. 14. Even though you may be a geek, be a manly caveman between the sheets – ladies like that. 15. Find female geeks. This isn’t as hard as it sounds. They do, in fact, exist! You can meet female geeks in many of the places you usually go (e.g., the comics shop, local conventions, video game tournaments, etc.). Take a dance class or a yoga class. This will help you make female friends, but it will also get you used to spending time with them very quickly. 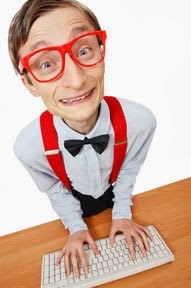 You can also get online to have an even easier time meeting female geeks. 16. Find things the two of you have in common. If your lady is geeky, explore your geekiness together to find activities you have in common. If she’s not a geek, find ways that you can introduce her to geeky things she might enjoy. Minecraft or the Sims are easy ways to introduce her to video games. She probably already likes Harry Potter or Lord of the Rings. So introduce her to other good fantasy books and movies. 17. Get to know your lady. Ask her about religion, politics, what she likes to do for fun, her family, where she grew up, etc. However, don’t be demeaning about her answers! Respect her opinion and ideas. She’ll love that. 18. Go places and do social things that make you feel uncomfortable. With time, you’ll learn that you get through the awkwardness and the discomfort of “risky” social situations. 19. If you want a lady friend, you’re going to have to know some ladies first. Unless you are a master of asking ladies out, you’re probably going to need to befriend them before asking them out. There aren’t very many women that want to date someone they don’t know at least a little. Meet them at school, while out doing activities (e.g., going to the gym), or even at the supermarket. 20. If your new lady friend is not a geek, don't ruin it by trying to convert her. Never assume that, deep down, she really must be "one of us" and simply needs to come out of the closet. 21. Once you’ve met a lady that you think might be nice, hang out in groups first. This will make both of you more comfortable, since you’ll be able to get to know each other and interact without feeling like you’re on a date. 22. Smile, laugh, and tell jokes! Ladies want to be around men who are fun. They love to laugh. 23. Take care of yourself and your appearance. Don’t feed the stereotype of geeks not taking care of their bodies. Wash your body and hair regularly, wear clean clothes, and brush your teeth. 25. Want to really hit a home run with your lady friend? Then be a good friend by being supportive when she's having a hard day, helping her take her mind off of her problems, being available for her if she needs help, and listening when she needs to talk. 27. Work on overcoming shyness. One trick to overcoming shyness is to imagine the worst thing that could possibly happen, and then ask yourself: “Would it really be the end of the world?” It feels bad to experience things that go wrong, but you won’t die. In a few weeks, you probably won’t even remember it. So, try to let go in situations where you’re shy and just enjoy yourself. Ashley said... It just means that you haven't found a geeky girl to go with. I know my husband dated a few "popular" and "social" girls in high school before meeting me in college. While I am definitely more social than him (he's the Aspie), I'm the one who got the Dr Who art for the living room and painted an 8-bit Mario theme in his office (around his dragon collection). Being a geek IS a good thing, so find someone who appreciates it. I love my husband and wouldn't trade him for someone who could work on cars or someone who would go to more dances with me instead. Not in a million years. Adrian said... I disagree with this. 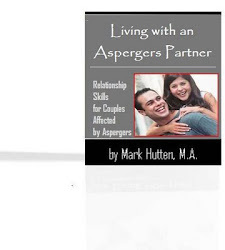 I think that being yourself is really important in any relationship, and that includes people with Asperger's. Remember that for everyone out there is someone else just like them, or someone who is compatible with them. They just need to find that person. The key is to be like an antenna for them, to be open for them to come along, but not to actively seek them. If you look for a relationship, then it will never come, or not a good one at least. But if you are simply open to the idea of one, and looking for the clues that one is coming, then you can be happy. Anonymous said... I was informally diagnosed when I was 8 years old, back when they didn't have a proper formal structure and for reasons that I have never been told, I was never actually told about it, until I figured it out for myself when I was 18. At a guess, they were trying to stop me from facing discrimination. I was treated for it, but wasn't told what they were treating me for! As such, when I was 18, and first knew about it, I didn't see the need to have it formally diagnosed, and was happy with an informal diagnosis. It was validated by, at a guess, 13 psychiatrists and 15 psychologists, but it was still informal. I did get a full formal assessment eventually, last year, but only because I needed it for a court case. It doesn't actually make any difference to my life to have a formal diagnosis. The only reason to do it was because I was fighting a discrimination lawsuit and their excuse was that I wasn't really autistic and they didn't recognise an informal diagnosis, no matter how many people agreed with it or how long it had been for. So I got a formal diagnosis and won the court case. Anonymous said... I have a lot of trouble making friends. I always have. I have never had more than 4 or 5 friends at a time and I have never kept them for long. It used to bother me and even make me depressed but I have become more accepting of it as I have got older (I am now 39) and I just know that I am never going to make too many friends. I also found that worrying about it made it worse, so, since I have stopped worrying so much about it it has been a lot better. I don't have any more friends than I had before and they don't last for any longer but at least it makes me happier with them. I appreciate them more than I used to. Anonymous said... You might be surprised to learn that I have never had any trouble with romantic relationships. As an autistic, I am supposed to have problems, but I never really have really. Compared to most people I know, I have been a lot happier in relationships than most neurotypicals even. I had my first girlfriend when I was 4, long before I was diagnosed, and we were together for 2 whole years before our parents split us up. The next one wasn't until I was 13, but I have had many since then. The reason, at least partially, is because my older sister gave me some really good advice about it, which I checked very thoroughly over a period of several years, and I found it is actually true. I stop trying to be perfect and instead I am just me. You might be surprised how many women out there really love autistic men - they find it attractive. Not all of them do, of course. So I stick to the ones that like it. My current girlfriend, who I am going to marry in a month, is dyslexic, and she has some of the same issues as me. I previously went out with a girl with ADHD, and I have gone out with neurotypicals too. To date I have never gone out with a girl with autism, strange as it might seem. I went on a date with one once but we weren't compatible. That is not a part of what makes a girl compatible with me! It is more their beliefs that attract me - the kinds of things that are important to them. Anonymous said... On the school front, I was doing badly at school for the first few years before I got diagnosed but since then I have done very well, until university when various political situations arose to stuff me up. It had nothing to do with my schoolwork but everything to do with pressure from family and people at university, to do with them changing the system. Other people went through that problem too, where they couldn't do the degree that they wanted, and some waited, but I just ploughed through and ultimately politics cost me, so I never got a degree, and then at TAFE (like community college for Americans) I had more politics. Anonymous said... Oh I should add here that school wasn't great for me as I was constantly bullied the whole way through. But, rather than get depressed about it, I tried to work out how to fix it. After watching Karate Kid it inspired me to learn karate, but when that didn't work, I started reading up about martial arts, and learned the theory behind it. I have been in several fights since then and won all of them. I don't know a single move but I know what frame of mind you are supposed to be in when someone attacks you. It works every single time. I have had a whole street gang attack me and come out on top. I could go over how I was able to win in difficult conditions but suffice to say that it is similar to the romantic thing. I never look for a fight, and try to avoid them if I can, but if I have no choice, then I prepare myself for it. I haven't had any fight at all for about 10 years, and the last one was against 10 guys, which I won. The last time I had a fight against just 1 person was when I was 13. I still get picked on and everything but it never leads to physical violence anymore. I think they just kind of know that they wouldn't beat me. I never initiate violence though, nor do I encourage it. Anonymous said... If I thought that work would be politics free, I was dead wrong, though at least the politics I dealt with at school built me up for it. I finally got a job when I was 26, when I moved to a remote area where it is a lot easier to get jobs. The jobs I had there were full of politics. It was different every time. The most common one was having a girl I worked with like me and me say no to her advances. This was silly of me, as it turns out, as, while people say that "mixing business with pleasure is bad", what they don't say is that saying no to a co-worker gets them wanting to seek revenge. I have also had problems with people feeling jealous of how well I have gone and have tried to sabotage my work. Oh and people who think I am lying when I say that someone is trying to sabotage my work or is upset that I rejected them, and then cause problems for me because they think I am lying! But there have been a myriad of other problems too. Three times I was fired for being autistic. The first time I filed with the Ombudsman and got paid for 6 months for doing nothing before a weird manipulation meant that I won but got $0 and no job out of it, even though everyone else got it, because I got incorrectly added to a group complaint that ultimately didn't apply to me. The second time I filed with unfair dismissal and got a $10,000 payout. The third time I filed with unfair dismissal and got my job back plus a $15,000 payout - though I later quit that job after they just escalated the level of discrimination I was subjected to to inhuman levels and the courts weren't quick enough to deal with it. But it isn't always so obvious either. Last week I was told that I had an "illness" and that I had to be seen by a doctor to prove that I wasn't contagious. After seeing them, I was told that I wouldn't be paid for a month because of it. When I told them that they had to pay me and quoted various laws, they told me I had to work for free for 3 months and then come back part time for another 3 months and promise to take back my requests to be paid or they would fire me. So I told them to pay me by tomorrow or I quit. So they paid me, and "accepted my resignation", even though I hadn't resigned. Everywhere I go I get this discrimination. Anonymous said... Mind you, I don't get it from everyone. Most people are fine. It is just that the people that do it somehow have a green light to do it and once someone does it they somehow find this way to convince a lot of normal people to discriminate against me by accident. Somehow I come across as dishonest or something. I mean I don't if I am not around a bigot, but when one is around they just convince everyone. Anonymous said... It can be hard but I guess that it is just as hard for everyone else too, not just for other autistics, but for everyone. I find it is bad to feel sorry for yourself. Or to think that I am worse off than anyone else. It is just different. We each have our own problems. The key, I find, is to have the right perspective.